I know Christmas has passed but this is my favorite picture of all time. I share it with you in hopes that you can feel the spirit of it by looking at it. We have this picture hanging on the wall in my room. I wanted to learn more about this artist because this picture had a very special influence on my life the first time I saw it. I was serving as a missionary in Brazil in 2004. The Sao Paulo Temple was being rededicated in february of that year. A bunch of the sister missionaries in the Sao Paulo missions were able to serve making contacts, help people with questions during the tours and work hard to follow the spirit to know who needed the gospel truth in their lives. It was the most amazing part of my whole mission BAR NONE!! :) So yeah I was so physically and spiritually exhausted from getting no sleep and talking to a million people in a 12 hour period that I just needed some peaceful time for a couple minutes. One of the mission presidents wifes took us downstairs to one of the rooms that we hadn't seen yet before in the temple during the open house. I saw this picture and felt and knew that the Savior loved me!! The spirit filled my heart and an overwhelming peace helped me to continue being a missionary. As a foreshadowing of His future triumphal entry into Jerusalem as the Son of David and the King of Israel, the unborn Christ is carried by a donkey to Bethlehem to be numbered of the house and lineage of David. 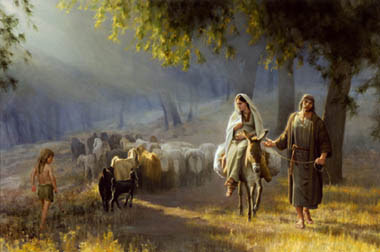 Mary looks tenderly, perhaps knowingly, at the shy shepherd boy they pass along their way. Would she have remembered the prophecy that spoke of her future son as the “Shepherd of Israel”? (Psalm 80:1) Mary’s hand is held to her womb as she meets the gaze of the shepherd boy as a reminder that “unto us a child is born, unto us a son is given” (Isaiah 9:6). Joseph’s focus is on the path ahead, and his hands, one opened and one closed, reflect both the strength and gentleness of the provider and protector. Meridian Magazine: Interview with Artist Joseph Brickey, Art that connects the senses and the spirit. I love that pic too thanks for sharing the picture and story. It does give a sense of peace just looking at it. I like to picture you in Brazil looking at it. What a neat experiences you had on your mission. Wow, Bri, what a great story and a beautiful piece of art. I love knowing what the artist is thinking while they're painting it and what things are purposeful (like the hands). That's beautiful. Thanks for sharing it!